The services that Hart’s Tree Services can provide include pruning, removal, emergency tree care (storm damage) and various other services. If you are unsure which services you require, call us and we can assist you. You may have trees that interfere with overhead wires, building facades, gutters, roofs, chimneys, windows, or those that obstruct streets or pavements. We can also advise you on preventive maintenance to keep trees in good health which will help the tree better defend itself against insects, disease and site problems. This is the removal of selected live branches growing throughout the crown of the tree. Crown Thinning can result in an even distribution of foliage therefore allowing light penetration and reducing wind resistance on the tree. This type of pruning can reduce the potential for storm damage. This is the selective removal of the lower branches of the trees crown. This is done to prevent danger to pedestrians or vehicles which may pass the tree, or it can be done to allow light through. This is done to allow the continued conservation of the tree where structural problems might otherwise demand the loss of the tree. 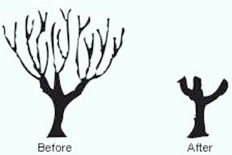 Crown Reduction is used to reduce the height and/or spread of the crown of a tree by the removal of the ends of the branches whilst maintaining the trees natural shape as far as possible. This is a heavy crown reduction technique and is appropriate where the crown of a tree is too large for its location or in some instances where extensive defects and weaknesses might make the tree unstable. Severe pruning of this type can cause vigorous re-growth on the tree. Removing dead, insect-infested or weak limbs that pose a hazard or may lead to decay. Performing this kind of pruning can prolong the life of a tree and prevent damage to property as well as prevent injuries to anyone who may be struck by a falling dead branch. We also offer tree planting services. Please don't hesitate to contact us for more information. This is the complete removal of a tree. It is necessary to do this to dead, dying or diseased trees to prevent damage or injuries. This can be done by straight felling (where space permits) or by dismantling the tree in sections, we are fully experienced in directional and controlled felling of a tree using winching techniques. We are experts at large and dangerous tree removals. When a tree is deemed hazardous and there is no other solution, we will perform a clean and efficient surgical removal of any tree from your property. All aspects of removal detail will be discussed prior to the job so that you will know exactly what to expect. Hart’s Tree Services offers a stump grinding service and can remove the smallest to the largest of stumps. Tree stumps can be a eyesore, can be difficult to mow around and most importantly can be a hazard to unaware persons. Apart from our tree work we also carry out hedge pruning and general garden maintenance of shrubs and bushes. We can trim any kind of hedge and we ensure that our work is carried out safely and that all brush is cleared away. Removing limbs damaged by adverse weather conditions. Storms may cause limbs or entire trees to fall, often landing on homes, cars, and other structures or other trees. The weight of storm-damaged trees is great and they can be very dangerous to remove or trim. We can assist in performing the job in a safe manner while reducing further risk of damage to your property. We use bio-degradable chain oil to help protect the environment. This is especially important when we are working around ponds, rivers, streams and wet woodlands. The Stihl chain oil we use is the best of its kind, 80% of the oil degrades in just 21 days.